An Aggie indoor season that will include the first-ever home meets for the Texas A&M track and field program begins on the road this Friday with an Arkansas Quad meet featuring the host Razorbacks along with Mississippi and Oklahoma. 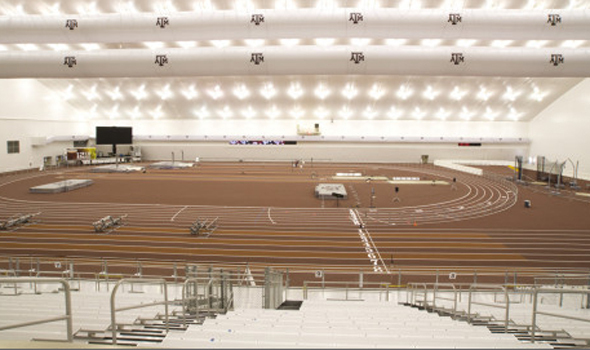 Five meets comprise the inaugural home indoor schedule for the Aggies in the recently completed Gilliam Indoor Track Stadium at the McFerrin Athletic Center near Kyle Field. The five A&M home meets include three regular season competitions as well as the Big 12 Championships in February and the NCAA Indoor Championships in March. "Home becomes an important aspect to this whole thing," Texas A&M head coach Pat Henry said. "This is the first time we’ve been able to run at home. We just had a senior class finish without having an opportunity to compete in a home meet. "This is the first time now that we get to compete on campus. Our athletes get to compete in front of their peers. So, there is a lot of excitement around here." Individual tickets for Texas A&M home meets, including the Big 12 Conference and NCAA Indoor Championships, go on sale Tuesday, January 6. Information regarding available seats and ticket prices is available at 888-99AGGIE (888-992-4443) or via the www.12thmanfoundation.com/tickets web site. Season ticket options for all five meets remain, but the Gold section has sold out and there is a limited availability in the Silver section. Even seats in the Bronze section may be limited once individual tickets are on sale. "We’re fortunate that we probably have the finest facility in the country now indoors," Henry added. "All of a sudden Texas A&M becomes a spotlight with indoor track and field. "One of our goals is to have a couple of track meets where fans can come in, watch and spend a few hours just like any other athletic contest and not spend an entire day there." The Aggies host a pair of meets in January that feature a three-hour time schedule. Action at the Gilliam Indoor starts with the Texas A&M – UT dual meet on January 24. The Aggie men will dual Texas as the A&M women dual Tennessee. The last dual meet between Texas A&M and Texas occurred during an outdoor meet in March of 1997. "We’re looking forward to that competition," Henry noted. "I think it will be a great one for our fans to open the facility. We likely will have some dignitaries to start the first races. So, we look forward to a lot of excitement in the building in addition to opening a brand new facility." The following weekend, Jan. 30-31, will feature the Texas A&M Showdown between the Big 12 and SEC. The Aggies will join Texas and Missouri as they square off against an SEC trio that includes Florida, LSU and Mississippi. "If you look at the Big 12 and the SEC, they’re two of the strongest conferences. The Pac-10 will work in there with Arizona State, USC and Oregon, but when you start looking at the conferences it’s the SEC and the Big 12 who have extremely strong presence at the NCAA Championships. "So to get two other Big 12 schools in here and three good SEC schools I think it brings another element in. It will be scored as the Big 12 versus the SEC and that will be fun." A road trip to New York City will have the Aggies competing in the New Balance Collegiate Invitational at the Armory on February 6-7. The field of schools competing at this Invitational is one of the largest in the country for an indoor meet and provides NCAA Championship level competition in various events. Returning home the Aggies will host the Texas A&M Invitational on February 13-14 as a majority of Division I programs from Texas meet in College Station along with a couple of schools from Louisiana. Also scheduled to compete are Arizona State and Miami. "We wanted to get as many Texas schools into the new building at one time as we could accommodate," said Henry. "In the future I think we will likely have small meets and run schedules that are fan friendly. Our sport needs to be fan friendly, not just athlete friendly." The postseason will feature a pair of entertaining weekends at the Gilliam Indoor Track Stadium. First there is possibly the finest conference meet in the Big 12 Championships scheduled for February 27-28. Then the highlight of the collegiate indoor season, the NCAA Championships, is set for March 13-14. The NCAA Indoor Championships, now in its 45th year, leaves Fayetteville for College Station this season as Arkansas plays host to the NCAA Outdoor Championships in June. It will mark the first time the State of Texas has hosted the NCAA Division I Indoors. Texas A&M women will seek a third consecutive indoor team title at the Big 12 meet while the men challenge for their first conference title since 1980 after placing fourth last year. Both squads return eight All-Americans from a successful campaign in 2008. The Aggies placed among the top 10 in last year’s NCAA Indoor meet with the A&M women finishing a best-ever seventh while the men tied for 10th to produce its best finish since 1990. Outdoors, the Aggies made big strides as the women placed third, it best effort in the history of the program, and the men finished fifth at the NCAA Championships, its best result in 20 years. "To have the Big 12 here in the first year of the building opening and then to run the NCAA meet a couple of weeks later will be a unique experience ," Henry noted. "It’s a tremendous challenge for us as a staff, and a great opportunity for our team to run at home in an exciting environment. I think people in this community will love to see great track and field contests, which has been void for a long time here. "It’s a tremendous challenge hosting the conference and national meets. We’re in the process of formulating our officials association. We’ve had good participation already from people, so I’m extremely pleased with that. Not only from our own community, but people from all over the state and country will come in to help put on our home meets."